Buy $50 of mini office supplies and get a free $25 gift card for Dunkin’ Donuts or Starbucks. I don’t even know how you’d choose!!! And this is just one of the great new office supply rebates at OnTimeSupplies.com. Buy $75 of qualifying Avery Products, get a free Target Gift Card. Qualifying products include a wide variety of Avery labels, business cards, index dividers and binders, so you can get all the Avery supplies you need and claim your gift card. Free Gift Cards w/ Scotch & Post-it Products. The latest 3M mail in rebates offer free coffee and ULTA Beauty gift cards when you buy $50 of qualifying products. 3M always comes out with great rebates for their customers. Which it great, since most offices run through Post-it Notes and Scotch Tape at a steady clip. If you’re the guy or gal whose job it is to keep your office supplied with 3M basics, download one of these mail in rebate and treat yourself!!! Buying office paper in bulk always saves your office money. Now you can save a little more! For a limited time, HP will give you $5 cash back for every bulk 10-ream carton of HP Premium Choice LaserJet and HP LaserJet Paper you buy. 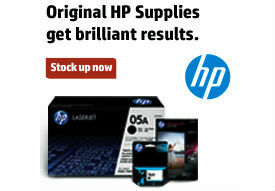 Plus, HP is offering great rebates on ink and toner too, so be sure to check those out as well. These are just a few of the deals in the OnTimeSupplies.com Rebate Center. Be sure to bookmark the page. OnTimeSupplies.com is constantly adding new rebates for free products, gift cards and cash back on purchases.